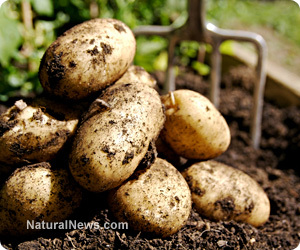 (NaturalNews) Regular white potatoes are one of the most controversial vegetables from a health perspective. Like many nightshade vegetables such as tomatoes, eggplants and peppers, potatoes are often associated with adverse reactions and can be difficult to find in high-quality form. That they're the main ingredient in countless junk food products, such as French fries, doesn't exactly bolster their public reputation either. In reality, however, organic potatoes grown in good soil and prepared properly (i.e. boiled or baked, not microwaved or fried) contain a surprising number of health benefits. The fact that certain populations throughout history, notably the rural populations of Ireland in the 19th century, could almost single-handedly survive on them is a testament to this fact. This article takes a closer look at those benefits. Potatoes are an excellent source of vitamin C. In fact, the Spanish explorers who brought them to Europe from South America in the early 16th century kept potatoes aboard their vessels to prevent scurvy. A large boiled potato contains approximately 37 percent of our recommended daily intake (RDI) of vitamin C, while a large baked potato contains 48 percent of our RDI. Vitamin C is, of course, an essential antioxidant with anti-aging and disease-fighting properties. Long-term consumption of vitamin C-rich foods has been shown to prevent cancer, improve skin and hair quality, and tackle most known viruses. Most people tend to associate phytochemicals with colorful or leafy green vegetables, and potatoes, being a rather bland shade of yellow, really don't look like they could contain much of them. According to the American plant geneticist Roy Navarre, however, nothing could be further from the truth. After scrutinizing over 100 types of commercially-available potato, his team managed to discover over 60 different kinds of health-boosting phytochemicals and vitamins within them including chlorogenic acid, numerous phenolics (such as flavonoids) and kukoamines. Kukoamines were a particularly shocking find since these natural chemicals, which are known to reduce blood pressure, were believed to be unique to the Chinese superfruit, goji berries. Baked potatoes are the best land-based sources of iodine. In fact, just one medium-sized baked potato consumed with skin (which is where most of the iodine is concentrated) contains 40 percent of our RDI of this essential trace mineral. Iodine is most commonly found in sea-based foods (such as seaweed and fish) and is responsible for regulating the thyroid gland, which in turn regulates the metabolism. Sadly, iodine deficiencies are rampant in today's society due to the mineral-depleting effects of ongoing soil erosion, making easily-available sources of it, like potatoes, something to treasure. Potatoes also supply us with high amounts of vitamin B6 (an important cell builder), potassium (helps to regulate water balance), soluble and insoluble fiber (flushes toxins from the colon and promotes regularity) and the essential macromineral magnesium, which is one of the most commonly-reported mineral deficiencies in the United States. Magnesium is known as the "relaxation" mineral because a deficiency in it invokes stress-related symptoms such as anxiety, insomnia, restless leg syndrome and irritability. Note: Despite their benefits, potatoes are still starchy carbohydrates and have a high glycemic index load for a vegetable. For those worried about blood sugar spikes but still want to eat potatoes, adding some high-quality oil or butter to the meal can help mitigate this. The fats in these foods prevent the potatoes from being metabolized too quickly. In fact, potatoes with extra virgin olive oil is a staple meal in several Mediterranean countries, and one is unlikely to find a healthier people.